Outlets: 1-110v. outlet within 50ft. Three, Two, One, Blast Off! 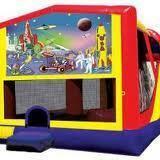 Experience the moonwalk and sliding fun with a out of this world slide combo. Sure to be hours or fun at your event!